This article is 2850 days old. City of Windsor parks and forestry crews were all called in during Saturday evenings storms and have been out ever since evaluating the damage caused. 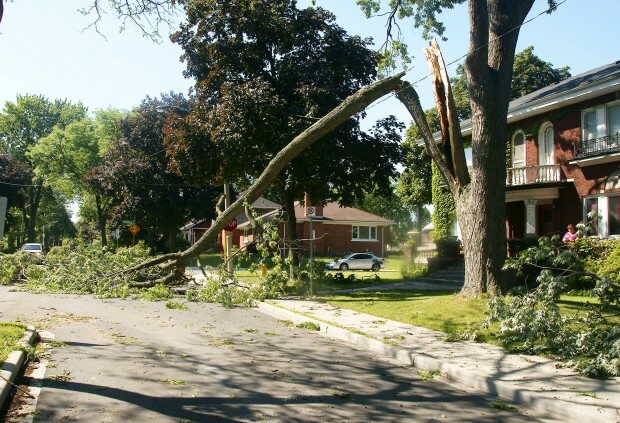 With winds up to 110k per hour, many neighbourhoods in Windsor experienced some damage, explained Bill Roesel, Manager of Forestry and Horticulture in a news release. Parks and Recreation is prioritizing the damage with clearing the roadways as the first priority and then removing broken branches in trees. The City of Windsor is responsible for trees in the front of property usually within 33-feet from the middle of the roadway. All backyard trees and shrubs and trees outside the 33-foot boundary are the responsibility of the homeowner. The City of Windsor is requesting that residents do not call repeatedly as all calls are registered and then property will be evaluated for further action.